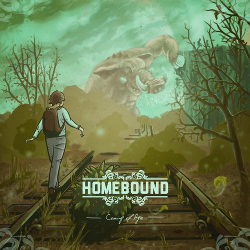 UK pop punks Homebound release their debut EP Coming Of Age on the 21st July. It’s a superb way to announce yourself, storming pop punk full of hooks and big harmonies resulting in an accomplished debut. As you’d expect each track is short and snappy, it delivers a direct punch resulting in each song resonating through your mind for hours after. You’ll notice the influence of Neck Deep and The Wonder Years throughout, it doesn’t bode well for an original sound, but what pop punk is? Homebound execute the pop punk sound with aplomb. ‘Clutching Straws’ is the EPs highlight; it is a delicious gem with some great punk riffs. You’ll find each of the six tracks instantaneous and easy to listen to. Title track and EP closer ‘Coming Of Age’ shows a different string to Homebound’s bow with some excellent guitar work. Overall the EP sounds raw, the energy simmers and bubbles over on the big choruses. At times you may feel it focuses a little too much on the vocal, a small gripe to another wise solid debut release. The UK pop punk scene seems to be going from strength to strength these days and Homebound are a serious and valuable addition to the scene. Expect to hear a lot more from these young upstarts in the future.